You are here: Home / Dogs / Yay, It’s The FedEx Guy! Nothing is more exciting really than when the FedEx guy shows up (though the UPS guy gets the same number of fans here, too). Whether sighted or blind, the dogs rush to the fence to check things out, barking and yipping as they go. It reminds me of that time from my distant?childhood when the ice cream guy used to show up in the neighborhood, driving around?with the bells ringing on the vehicle, and the kids would go rushing out into the street to greet him. 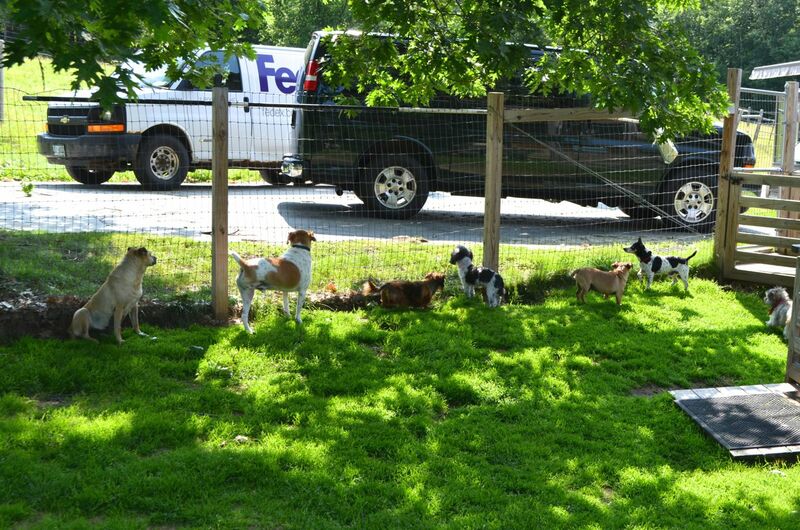 Kind of the same idea here, except the fence keeps these “kids” from swarming around the FedEx driver. From left to right in the photo, that’s Holly, Tanner, Sophie, Mabel, Sunny, Taco and Fuzzy. You can tell from the body language that the blind ones are just as engaged and interested, if not more so, than the sighted ones. After the FedEx guy leaves, the dogs drift back out into the yard and onto the front porch, waiting for the next exciting moment to arrive. WAY TOO FUN!! They are JUST like little kids! What a great photo! That sight must put a smile on the drivers face, too. That’s about as cute as it gets with all of them on dog duty “protecting” the premises while maybe secretly hoping for a box of dog goodies to arrive. Good team effort! Everyone loves getting packages. 🙂 And they have a nice shady yard to patrol. Great photo. Love them all………..and their respective names……….especially “Taco”! LOL! If I were the Fed Ex guy I would have trouble getting back to work after this stop, would want to hang out with all the rollin’ dogs!